I HOPE THE PHOTOS WOULD HELP YOU. Beautiful antique lamp with an extendable central column that is secured in place using a locking nut. The lamp is in excellent condition. The lamp has the patina expected of a brass item of this age, but has been cleaned and waxed to bring out the colour. The height of the lamp extends from 46cm to 66cm. The lamp has been fully rewired, with a braided silk flex, switched bulb holder and new plug. As with all electrical items, it should be tested by a qualified electrician before use. Thanks for reading. The entire piece is in excellent original condition and is sturdy, solid, and fully functional. There are no visible cracks or repairs, and nothing appears to be missing. There is a newer cord coming from the lamp and both sockets are working, but I haven't taken it apart, so all electrical components should be inspected for safety before use. Black and gold lacquered lamp. Stands 60cm high, original shade, newly wired. NO Glass Shade & Chimney. Stunning Design. Great shape and good proportions. Original antique oil lamp font, in very good original condition. An oil lamp converted to electric, lovely yellow shade. This lamp was tested a few years ago,but I strongly advise a rewired, better still, put back to an oil lamp ! Ref.BIN -Louis Valentin Elias Robert lamp-£385.00. C-Mid 19th C. CHQ drawn on UK bank “dispatch after clearance”. This piece is so beautifully detailed, and very anatomically accurate in its casting proportionality. This is a very stylish Duplex Brass Oil Lamp which I think is Art Deco in style The Beehive Shade sets it off to perfection. It still has its original cap to prevent soot damaging your ceiling. It is in full working order. An original antique gas light which has been converted to electricity, rewired and pat tested. Is in very good condition with its original fittings. A simply elegant brass wall light, can be used as an uplighter or downlighter. One Antique Oil Lamp with a Cast Iron Base, Blue Painted Fount and Glass Chimney( see Photo's ). The size of the Lamp is approx 24 " high including the Glass Chimney.The Glass Chimney is approx 9 3/4 " high. 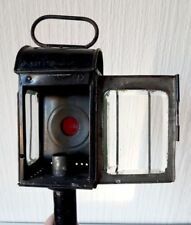 Beautiful antique pullman lamp from early 1900's. The lamp is in excellent condition. The height of the lamp is 32cm. The base is in the form of a winged fairy holding a floral white plastic shade. And dark wood light fittings of oil lamp form. Distance between fixing screws on back plate - 6cm. I have had this lamp for many years but have never used it myself, partly because it needs a minimum drop of over 48", which can be extended by 16" for very high ceilings, but could also be hung above a table. Burgundy printed lamp with Ivory printed lampshade Bulb included, fully functioning. Length: 19"
Logo is faded but reads FAMOS 129. Gorgeously elegant and simply brass oil lamp. Star cut inverted base. Approx across base 4 1/4". AN UNMATCHED PAIR OF CONVERTED SWIVEL GAS LIGHTS. MADE OF BRASS WITH ALUMINIUM SHADE HOLDERS. THERE IS NO MAKERS MARK BUT THE IS A ATENT NUMBER 226904. No makers mark. Height - 41cm and 51cm to the top of the handle. Stunning Midcentury tall crystal l free-form table or desk lamp by Daum, France. Marked on bottom edge with acid etched "Daum - mark. (no shade included). The beautiful sculture is signed to the circular clear base signed 'Daum France. '. "VICTORIAN". Oil Lamp Supported on 3 - Floral Supports c1890 - 1910. Oil Lamp with 3 - Floral Stands. We have Listed this Item World Wide. FINISHED WITH A MATCHING ORIGINAL GREEN GLASS TULIP SHADE ( IN SUPER CONDITION ). 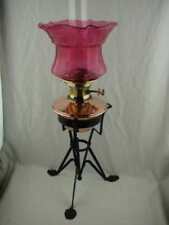 AN ANTIQUE VICTORIAN TABLE OIL LAMP. THIS TABLE OIL LAMP IS IN EXCELLENT,LIGHTLY CLEANED,ANTIQUE CONDITION AND IN FULL WORKING ORDER INCLUDING WICK. "VICTORIAN". Duplex Oil Lamp Converted. c1890 - 1910. Duplex Converted Oil Lamp. We have Listed this Item World Wide. This is very nice and decorative pair of Art Deco lamp, from 1920s, original from France. They are really beautiful. 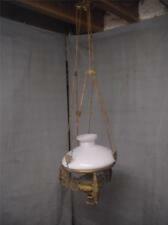 They are made from alabaster and give very nice soft light. Real original, no imitation. 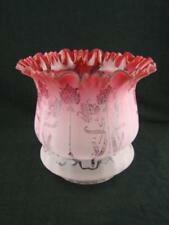 Art Deco matching mottled pink glass shade. with Pink Mottled Glass Shade 1930s. Nice addition to any Art Deco collections. The lamp has been rewired by a professional electrician so the lamp is safe. Original 1900s Art Deco French Lamp Woman Figurine Statue with glass globe, NICE Dimensions: The marble base is 12 1/2 " L x 4 1/2" Wide x 1" thick. The statue is 8 1/2" tall with the base. The globe is about 4 1/2" wide and about 4 1/2". All seems to be in excellent condition. expected patina. No cracks, chips or breaks to the glass globe. Sits on a heavy marble bass. Weighs around 9 pounds. I believe the plug and switch is original. you may want to replace the plug at some point as there is no cover. Please let the photos guide you, Questions always welcome. Winning bid pays $35.00 shipping, PayPal is the preferred payment method. thanks for looking and happy bidding! Vintage Small Art Deco EXIT Sign, Rare HEAVY GREEN glass Triangle Globe. This vintage exit sign measures approximately 5 1/4“ x 4 1/2“. It is in excellent condition with some minor roughness around the rim and some minor scratches here and there. Overall very very nice. It doesn’t appear to be marked anywhere but would be believe it to be Kopp. PLease email if you have any questions or need more photos prior to bidding.Shipped with USPS Priority Mail. Old Antique Art Deco Era Table Lamp Base Pink Onyx Marble Light Fixture Metal. Shipped with USPS Priority Mail. A handsome pink onyx art deco table lamp, with adjustable shade holder. It measures 17" to 22" tall depending on where the buyer sets the shade placement. The center shaft can be slid up or down depnding on the drop and size of your shade. The has a pink onyx insert and pink ball spacer, with claw feet and ornate spelter edge. Dual candle socket, ornate pierced bridge piece, decorative candle covrers and decorative leaf motif under the candle covers. A handsome original art deco lamp, ready to go, just needs a shade. Any questions, please email. Measures 10" wide arm to arm. Thanks for looking. The rare 383 model. My other job is pastoring a Church in Florida. I scour estate sales, garages, attics and anywhere to find. The stars count, too. A rare green globe with original wiring. 23cm .Art deco Cranberry Glass Lamps Light .